This newly remodeled and furnished one bedroom has large windows in every room, clean lines, and comfortable furniture. The living area offers dining for up to four in front of nicely curtained bow windows. The circular table has an extra leaf and expands to an oval. A very comfortable couch, which converts to a double bed, shares the sitting area with a side chair, natural wood coffee table on wheels, and television—all brought together by area rugs. The fully equipped kitchen has bright white tiles paired with grey accents, giving it a modern look, and the large privacy-glass double window opens out over the courtyard. The ample room around the ultra large king-size bed demonstrates the spaciousness of the bedroom. With nearly a wall of windows, a large mirror, an antique three-drawer dresser, and an armoire, this room offers light, simple design, and comfort. In the bathroom, the attractive blue washbasin and bathtub pop against the white tiled floor and walls. The room also features a larger mirror illuminated by exceptional lighting, a towel warmer, double windows, shower, and new toilet. A half bath off the entry hall contains a toilet and sink, with mirror. A large hall closet provides more storage space. The shower had two shower curtains, one specifically covering a window. His made the shower very tight and uncomfortable as the two curtains blew into you as you were showering. Suggest trimming the window shower to cover only the window , or find another way to cover the window. Otherwise, awesome stay. Thank you. The apartment in the 16th arr. 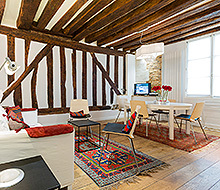 is everything and more of what the photos at Parisforrent indicated. We loved the large room, the day light, the large windows to the street, the high ceilings. A very comfortable bed. Having a washer/dryer saved us time . I loved the window in the kitchen that faced the court yard. We very much appreciated the respect to the old architecture. I was not expected a kitchen so well equipped : and with very welcoming details such sea salt from the Mediterranean vinegar from Dijon, sugar cubes. Very much appreciated. Oh, but the library was special. I read MERDE and John read 3 novels of C. Black ! A guide book to the neighborhood was helpful We mobilized on bus # 22 and 82 and walked to shopping which was very pleasant. The garbage on the curbs and the dog merde in the neighborhood was overwhelming, although, has nothing to do with the apartment. I loved France I want to return for longer time and may contact Paris for rent again. Thank you so much. 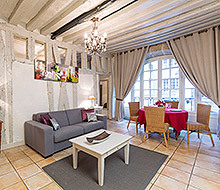 Great location, well equipped for a comfortable stay in central Paris. The check in process was easy and there were no problems during our stay or with check out. The building is old but in good shape, the only minor irritation is the creaky floors but those are expected in an authentic Parisian home from many years ago. We would stay there again. I travel to Paris one or two times a year and always use Paris for Rent and have always been very satisfied with the apartments . Patrick is outstanding with his insight and help. The Lauriston apartment was another great example of the quality of the Paris for Rent properties . It was just as shown on line and the discription very accurate. Very comfortable and the location was great. 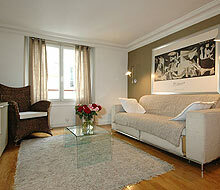 I was very pleased with this apartment and it was a nice change to stay in a true Paris neighborhood . I will definitely consider staying there again on future trips. The apartment was very comfortable and enjoyable. We loved the surrounding neighborhood. The notebooks with restaurant recommendations and how to get to the Metro stations was extremely helpful, along with the Paris Metro app, we rode the train everywhere, even to Versailles. Would recommend Lauriston to anyone visiting Paris.